Unique and Fun Garden Decorations ………and Cheap! It’s time to dress up the garden with some new decorations. I am way behind with my gardening this year as this spring has been a really wet one. We had snow still on the ground a month ago and now we are in full blown northern Maine Mud Season. But I can’t put the process off any longer so as soon as the rain stops (it’s been raining here for about a week with no sun) I have to don my “mud boots” and get the flower beds cleaned up and the spring plantings in the ground. But today I am searching the web for some fun ideas that won’t cost a lot but will give the garden beds a much needed facelift. I like whimsical and fun for garden décor. Formal and manicured is not my style, I am a casual girl when it comes to decorating the garden. 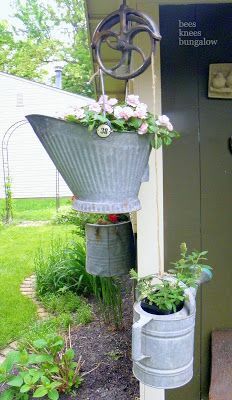 Found this garden decoration idea on Pinterest pinned by beeskneesbungalow.com . Evidently the “Bees Knees” blog is no longer as I tried to follow the link on the pin and it went to a domain parking site. Too bad cause this is one cute idea. 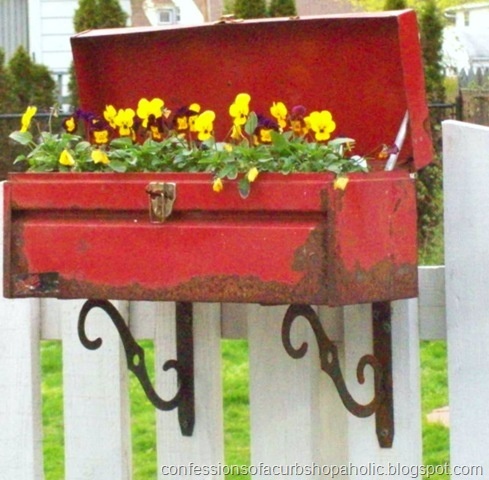 I even have the coal scuttle and the pulley so this will be a cute one and an easy one for me to pull off. Another score from Bill the Packrat. I think I will do it over by the tractor barn. 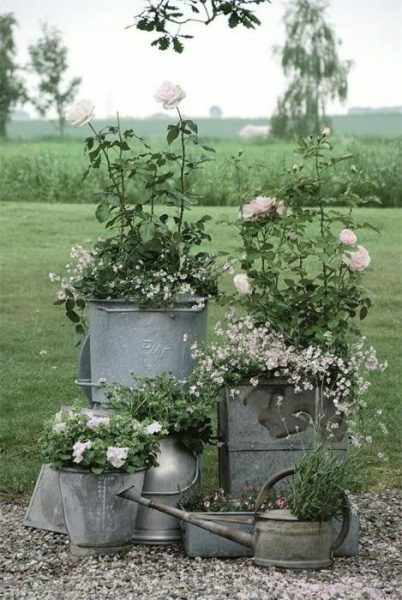 It is a cute container garden and a very clever use of old galvanized tin. Recycle, recycle, recycle! Ok, Old Bill the Packrat is 3 for 3 here! Maybe his hoarding and dump picking isn’t quite such a problem. This is one of those ideas that you see and you hit yourself in the forehead and say “why didn’t I think of that”! I saw this on an old BlogSpot blog called “Confessions of a Curb Shopaholic”. Hmmmm…. does that make Bill a “Dump Shopaholic”? 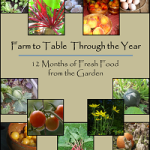 Although the original blog is long gone the idea lives on here and in my garden. These old toolboxes are everywhere and I am sure that you could find one at your local flea market for very little money, if you don’t have one kicking around out behind the barn in your own junk pile. And if you don’t have any vintage brackets like here, you can always grab some new ones at Home Depot and rough them up a little to make them look vintage. 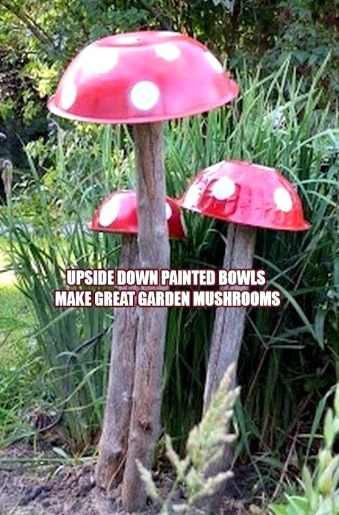 Magic Mushrooms in your Garden…….as Garden Decorations! Another idea I saw on Pinterest but could not find out who to give credit to. I think this is fun. If you don’t already have an old set, there’s always yard sales. They don’t have to match as you will be painting them. Grab some spray primer and spray paint at Walmart. Trim a few limbs of a tree for the stems and you have another easy, whimsical decoration for your garden. These rubber boots were spray painted. Personally I would have chosen another color but it still is a fun idea. There are times during the early spring gardening season that I have stepped out of my boots in the garden but it was because they were stuck deep in the mud. I am always starting work on the garden to early but when you live through a cold, dreary northern Maine winter you get real excited about venturing into the garden hoping to see green shoots appear in the ground…even weeds are reassuring after the starkness of winter. This fun idea was found on The Happy Zombie blog. More galvanized ideas …..how many women have husbands like Bill, anyway? Is it an epidemic? Like the zombie apocalypse! 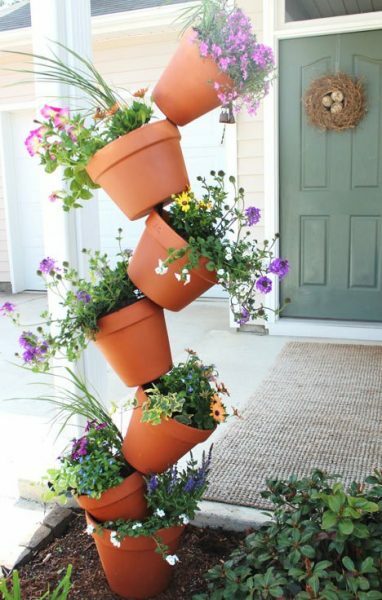 Over at The Gardening Cook blog are a slew of great ideas like the one pictured below. I can’t imagine what the work day of a woman who had to wash clothes in a tub with a washboard was like. But just thinking about it makes me want to go hug my washer and dryer and the dishwasher. 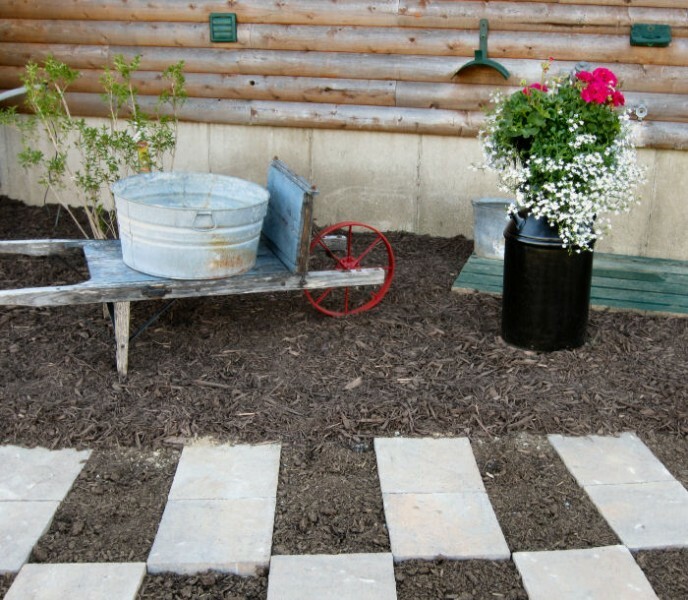 Making little vignettes like this one in the garden adds charm to your garden space. I like the idea of having visitors stroll through the garden and discover these little surprises. Who’s that lady in my garden? One GREAT (yes, I’m shouting) idea! This one has got to be my all time favorite! When I am scouring the antique shops and flea markets along coastal Maine this summer I will be looking for a dressmaker’s mannequin like this. 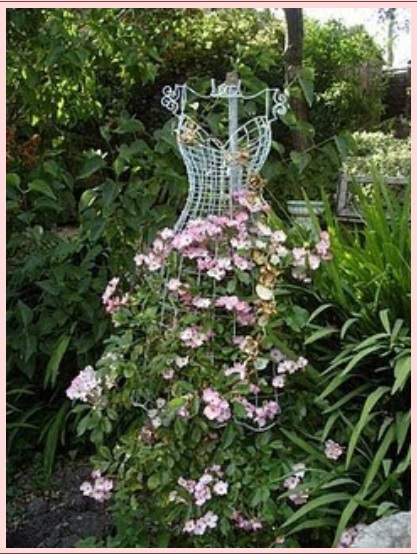 I love the delicate wire frame with the flowers….so very feminine. I want this in my garden so bad! 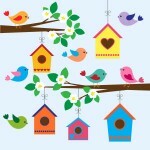 I found this at the Chateau de Fleurs blog. She has some wonderful ideas on her blog so be sure to visit. Help, There’s a Giant in my Garden….. The English are known for their love of gardening and this idea from across the pond is so clever. It’s not a quick or easy idea but it is so fun that if you have a strong and willing man in your life this would be worth the effort. Imagine the oohs and aahs you would get if you had these two hanging out in your yard! These reside in Cornwall, England and are the creation of Artist Sue Hill and her brother Pete Hill. 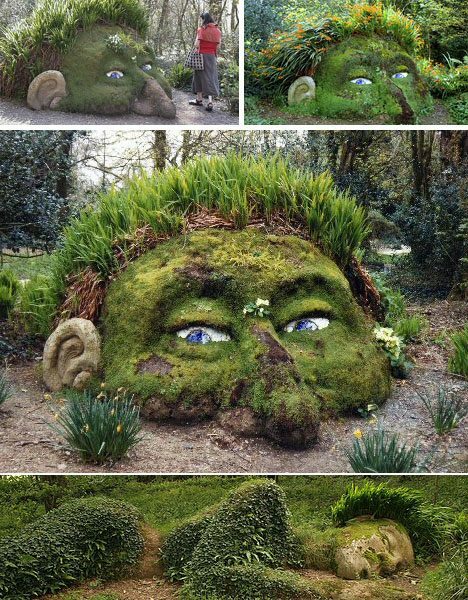 Such a great use of mosses and ornamental grasses. Stack’em up! Easy and not that expensive! Definitely a more attainable garden décor project! This garden decorating project is far more reasonable than some of the one’s above. The materials, terra cotta flower pots, are easily attainable at your local big box store, garden center, or hardware store. Easily maintained just water and pinch back blooms, this stack of flower pots is perfect for some cascading petunias. 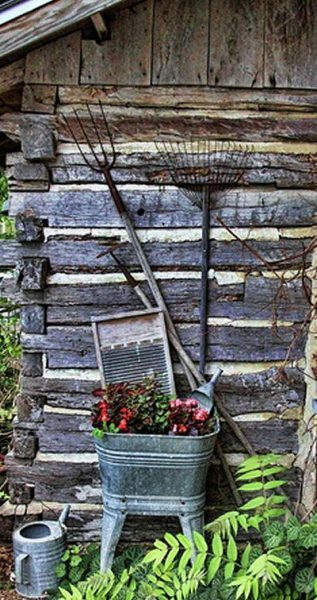 I found this on Pinterest which is great source for gardening ideas. Yes, I spend far too much time on Pinterest. I confess – it is my addiction! 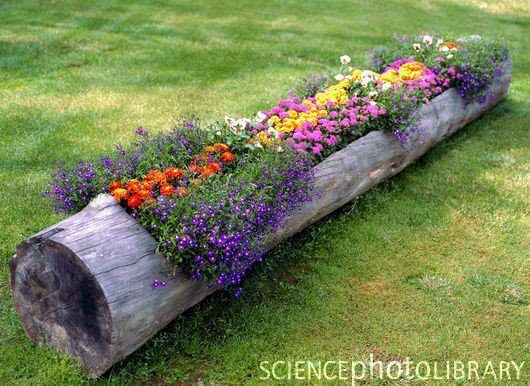 For me, this garden decoration project is very doable but it might not be so easy for someone in the city. I live in the middle of 60 acres of the North Maine Wood. There are blown down trees everywhere in our woods so it just a matter of finding one, trimming of the limbs, and carving out the planting area with a chainsaw. If you live intown you could check with a local tree surgeon to see what they do with the trees they have to remove from someone’s property or check the local landfill as they usually have a separate pile of trees and brush. Anyway its a neat idea that I first saw on the Science Photo Library quite a while back. Saved it because for me it was very “doable”. So there are enough ideas to keep you busy for a bit! 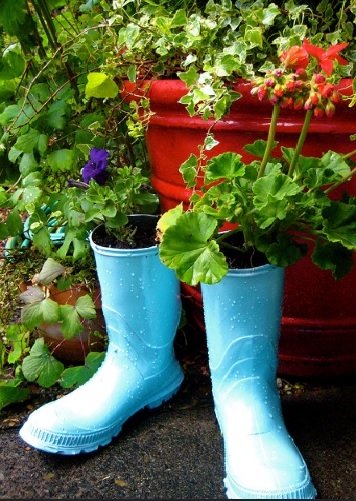 I just finished my morning coffee so its time to put on my gardening gloves and my big rubber boots and head out to the gardens. 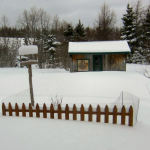 There is no more peaceful place in the world than the garden with a gentle breeze blowing, the song birds sweetly chirping, with the solitary peace only be broken by the occasional smacking sound of me slapping blackflies – the scourge of the North Maine Woods.